The architectural styles of Palmyra are a testament to its history as a multicultural hub. Per UNESCO, “Architectural ornament including unique examples of funerary sculpture unites the forms of Greco-Roman art with indigenous elements and Persian influences in a strongly original style,” depicting “…the contact point between the cultures of Rome and Iran” (Linck and Fassbinder 21; “Site of Palmyra”). This is evident in “The local, stylized, frontal-figured ‘Parthian’ art [that] comprises statues depicting deities, notables … funerary busts … sarcophagi showing the deceased, wall paintings, including funerary Roman allegories (Achilles, Ganymede) plaster heads, and friezes” (Hornblower et al. 566). Subtle nuances in masonry observable when examining some column capitals even suggest a heavy influence from as far east as India (Seyrig 6). Until Roman occupation, Palmyrene artistic styles, in sculpture and architecture, were an extension of the Graeco-Parthian East, later adopting more Western forms, mimicking the styles of Hellenized Syria (Seyrig 6). Seyrig adds to the discussion of divine icons at the Temple of Bel, citing another relief featuring “…two gods fighting against a monster, while other gods are pictured beside them, clad in Hellenistic armour, all standing stiff, all strictly frontal. Such repetition of similar figures had been attractive to the ancient Egyptian and Oriental artist” (3–4). The artistic element of frontality—figures represented as forward-facing and rigid intended not to dramatize a scene but to evoke the spiritual presence of the divine—is a distinct feature of Eastern art, a form not to return until the Orientally-influenced Byzantines (Seyrig 4), but these icons were showcased in a structure indistinguishable from the Graeco-Roman tradition. “Palmyra, therefore, a forerunner of Byzantine art as early as about the time of Christ, once more appears to us in that function as an outpost of the civilization of Parthian Babylonia” (Seyrig 4). These motifs in relief sculpture were not the only elements exhibiting a hybridization of East and West—structural architecture spoke to this cultural confluence as well. Fig. 2. Temple of Bel. 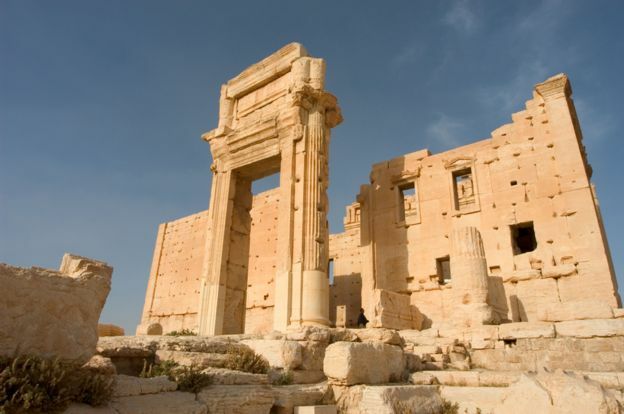 “Palmyra’s Temple of Bel destroyed, says UN.” Bbc.com. British Broadcasting Network. 1 Sept. 2015. Web. 15 Dec. 2016. Fig. 3. Temple of Baalshamin. 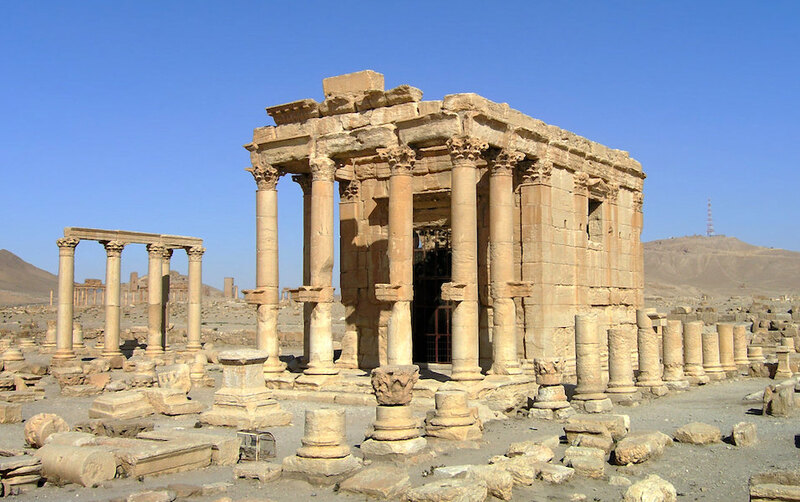 “Temple of Baalshamin, Palmyra.” Khanacademy.org. Khan Academy. n.d. Web. 15 Dec. 2016. The Roman Theater at Palmyra is unarguable the most striking work of architecture in the city. Like the aforementioned temples, the theater is accessed via Palmyra’s intricate, ornate system of colonnades, a sequence of which leads to two large entry archways at either side of the stage. Undoubtedly constructed around the time of Hadrian’s patronage, “Its style suggests that the building is Hadrianic, as would agree with the unusually complicated planning of the stage … The surrounding colonnaded street is met on the axis of the theatre by a short colonnaded avenue leading southwards to a monumental entrance which later became the rear-court of a fortified city gate” (Richmond 48). Fig. 4. Roman Theater at Palmyra. Ancientshare.com. n.d. Web. 15 Dec. 2016. Adjacent the theater exists the ruins of Palmyra’s Agora, a 71-84-meter structure, entailing the Tariff Court and the Triclinium, within which stand two hundred columnar bases that once served as foundations of sculptures of prominent citizens: “the eastern side was reserved for senators, the northern side for Palmyrene officials, the western side for soldiers, and the southern side for caravan chiefs” (“Palmyra”). This market place was “…surrounded by a simple portico, of which the colonnaded front boasts twenty columns a side. The earliest inscriptions on the columns are Flavian, of A.D. 76 and 81, a time when Imperial road-making towards the Euphrates was in progress” (Richmond 48). That this complex was a public space is supported by the space’s resemblance to the Agora at Delos: “The back wall of the colonnade is pierced by no less than eleven doors, thus creating the impression not of a closed Forum, but of an open market-portico” (Richmond 48). Inscriptions deciphered within this complex exhibit evidence of trade networks on a surprising scale, indicating “…direct relations of Palmyra with Scythia, the current name for the Saka kingdoms of North-western India, to which Palmyrene merchant vessels, sailing from harbours on the Persian Gulf, had access by the mouths of the Indus,” suggesting that “…Palmyra and north-west India in those days belonged to a single cultural circle or sphere of influence, the centre of which most probably was in the Graeco-Parthian towns of Lower Mesopotamia” (Seyrig 6). Fig. 5. The Agora at Palmyra. “Palmyra (Syria), Part One.” Geographylists.com. n.d. Web. 15 Dec. 2016. Temple of Al-lat. 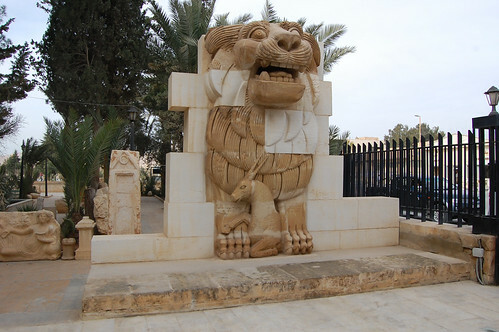 Little of this temple has survived the centuries, save a few columns—and, fortunately, the Lion of Al-lat: a 3.5-meter-high, 15-ton relief that once protruded from the original temple walls (“Lion of Al-lat”). Its left paw bears the Palmyrene inscription roughly translated as “Al-lat will bless whoever will not shed blood in the sanctuary.” (“Lion of Al-lat”). When discovered in 1977, it had already been dismantled and repurposed for the temple’s foundation (“Lion of Al-lat”). Fig. 6. Lion of Al-lat. Flickriver.com. Flickriver. n.d. Web. 15 Dec. 2016. Valley of the Tombs. The Palmyrene necropolis is comprised of a complex of funeral monuments: more than 50, four-story towers just outside the city walls. Elsewhere, the Palmyrenes constructed hypogea, or underground tombs (“Palmyra”). Fig. 7. Valley of the Tombs. 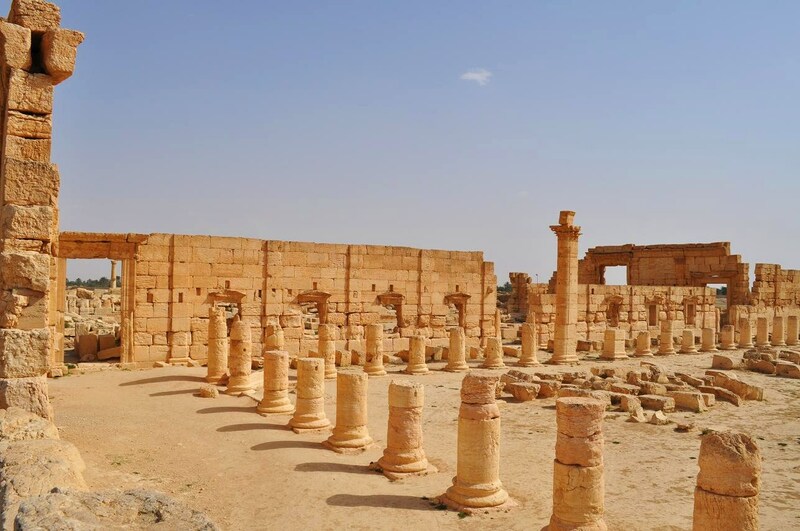 “Palmyra.” Wondermondo.com. Gatis Pavils. n.d. Web. 15 Dec. 2016. The Camp of Diocletian. Though largely ruined, this complex still exhibits a grand public bath, its entrance entailing four 12.5-meter-high, 20-ton, Egyptian granite columns, behind which is the bath itself, circumscribed by Corinthian columns (“Palmyra”). Fig. 8. Baths of Diocletian. “Syria – Baths of Diocletian, Palmyra.” Manuelcohen.com. Manuel Cohen Photography. n.d. Web. 15 Dec. 2016.